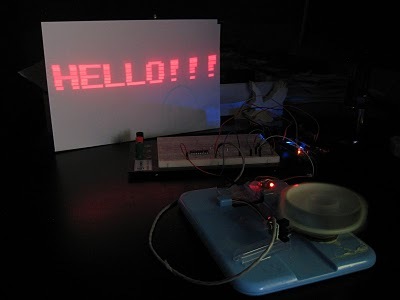 This laser message scroller is built with inexpensive parts. The heart of [Raul’s] system is a spinning pill-box with eight mirrors on it. Each redirects the laser to a different vertical portion of the projection surface. There are eight small arms on the apparatus that each break the beam of an optical sensors as it spins, facilitating the precise synchronization needed to generate the projected image correctly. In the video after the break we can make out what looks like an Arduino controlling the system. This makes sense as it’s easy to connect the laser pointer and sensor, and the USB connection allows for the streaming of messages to the system. [StaticChanger] built a scoreboard to display his kill statistics from Halo for the PC. Yes, we’ve seen kill counters before, but we like the way that he gathers the data. 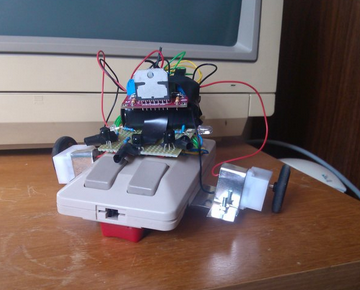 This project is reading the score directly from an address in memory. 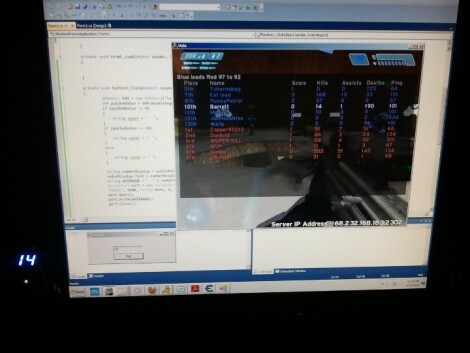 Using a program called Cheat Engine, the memory used by a program can be sniffed. After a few passes, the program will help you find a static memory address for your desired data. Once you have that it’s just a matter of using a pointer to that address in your desired programming language. In this case, a C# program polls the value and instructs an Arduino to display the value on a couple of 7-segment displays. Voila, the number appears next to your screen as you see in the image above. [Sprite_tm] has whipped up yet another interesting tutorial – software-based this time. He basically describes how he connected his Wiimotes to an HTPC. A USB Bluetooth receiver, and a little bit of Linux scripting, was all that was necessary to get the system up and running. To add to the fun, [Sprite_tm] configured a the controllers to work with MAME (an arcade machine emulator), allowing one to play Duck Hunt on a computer in its full glory!